Definition of intersecting lines and examples. Intersecting lines are two or more lines that cross or meet at one point. For example, the following two lines meet at point E.
Two lines can only intersect at a single point and this point is called point of intersection. 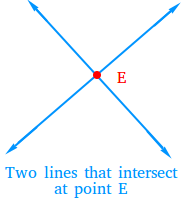 Point E is the point of intersection of the two lines. 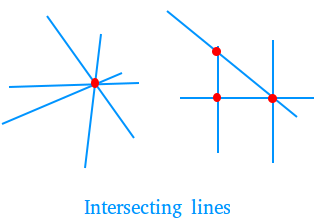 Three or more lines can intersect at a single point or they may have more than one point of intersection.